Things at IHaveANotion are once again busy behind the scenes. Locally, the other guild (I belong to 2) is having their annual Quilt Show in September. The show set up is on Thursday and of course the show will be on Friday and Saturday. I will have a full 2 weeks of preparation!!! for sure. Lots of little details to pull together. I have a huge respect for those that do this several weeks… in a row! A couple of times a year… is almost enough for me. So if you are passing through… stop in for some eye candy and vendors. IHaveANotion will be there… too. So getting ready is taking up lots of time!!!! and energy! But I love meeting people and sharing… the quilty life! So my time will be well spent. that subtly indicates that a quilter is driving! If I don’t see you …. over the weekend… Have a Great End of Summer and Labor Day holiday! know the last year has been a bit of a trial for us with dogs. We acquired Goldie after having to send Bandit back to the breeder. Goldie has the same dad as Bandit, but she has a different mom. From the beginning Goldie had some difficulties…. those rabbits… and the treats they leave behind are just the best!!! The back story is… Goldie was tested for Giardia and treated, but the problems persisted through 3 treatments, 2 months or so. 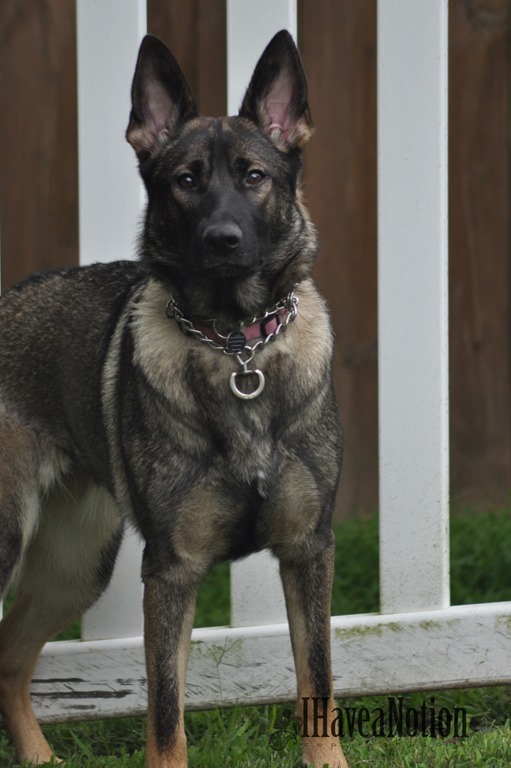 While she was gaining weight, she was still under weight for 5/6 month German Shepherd. So a specialist was recommended and off we went. After an office visit and leaving a sample… for testing… we waited. No wonder Goldie was having problems. She not only had Giardia, but she also tested positive for C-Diff and Cryptosporidium. Some more medications and then another test! Giardia gone, but positive for both C-Diff and Crypto… more meds. Another test. Yay C-Diff gone, but the Crypto… is hanging in. Vet said it was a difficult bug to kill. So another round of medication. The last medication had to be administered every 8 hours with a meal! and another test. Still positive for Crypto. So it was suggested that we continue the last medication for 4 or 5 months and retest. We have all been on the 8 hour schedule for 7 months with fingers crossed. We took a sample in last week. Goldie is almost a year old now. In just about 10 days she will celebrate her birthday. We will be celebrating lots more too. We got the call from the Vet this morning and she is CLEAR!!! When we started down this road Goldie only weigh about 35 pounds. She now weighs a respectable 75 pounds although she is tall thin dog, but the next 6 months should show her putting on some muscle and filling out a bit. We were outside one day last week and Goldie consented to a photo session. In the first picture you can see the juvenile in her still, but in the last 2 you can start to see the mature countenance she will have as an adult. We still have about 6 more months of a tween dog. She is looking so good…. She was spayed a month ago… and on September 7 she will be a year old. I hope she will consider being a healthy dog…. for the rest of her life. She looks so much like Bandit in this last picture!!! So do you have any good news to share? Has it really been 2 weeks? As usual… diversions and detours- and some quilting and sewing. This week started with a family thing… I posted these 2 pictures on Instagram…. Monday was a very long day! My niece and great niece moved from Indianapolis to Illinois…. Some difficult times for them. Left at 7 am and home at 10 pm. I saw my great niece and after a little play time on my lap, she fell asleep in my arms. We spent her 6th month birthaversary, the same way we spent her 6th day birthaversary. Asleep in my arms. Due to stresses and no phones allowed… no current picture her. But this one was taken in March, 6 days old. Tuesday was catch up… groceries and new glasses were in, but we are going back for those today… have an issue. Yesterday I spent more time in the car… drivivn a Goldie sample to drop off at the specialty vets… hopefully good news to post about next week!!! Some stitching, well almost stitching, alright more like almost quilting happening. This is an old top that has a bit of damage. I finally decided that it is not in good enough shape to spent time hand repairing the holes. So I created some fused flowers and ironed them over the holes. An old Grandmothers Flower Garden top infused with some modern hybrid flowers…. and mostly loaded on the longarm frame… I purchased it with the intent to quilting it up and use it as a table cover for shows. I didn’t realize how big it is!!! Have you been busy… quilting or something else? Tell us (me) about it!! !